What birthday celebration is complete without a cake? Certainly not Martin Luther King's and by total coincidence (unless you believe there are no coincidences), I baked a birthday cake today with both dark and light layers. 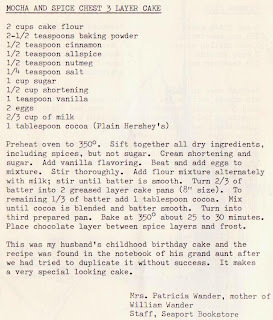 Birthday cakes are the quintessential home-baked cake, and I was especially interested in a recipe in the South Street Museum Cookbook (really, just a pamphlet), printed in 1972. 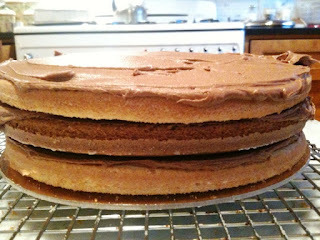 This "Mocha and Spice Chest 3 Layer Cake" is very unusual in that two of its three layers are vanilla spice and the center one is cocoa, making for, as the recipe's contributor, Patricia Wander, says, "a very special looking cake." This recipe predates the book's publication -- it was the childhood birthday cake of Mrs. 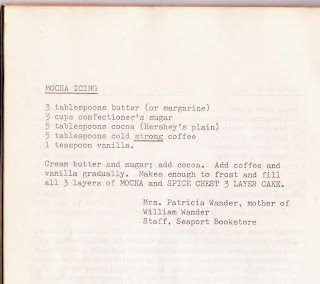 Wander's husband and she wrote, "the recipe was found in the notebook of his grand aunt after we had tried to duplicate it without success." My tasters (thanks Bev and Paul) really liked it. The flavor is quite sophisticated, especially for a child's birthday cake, but I think that reflects the era before super-sweet confections were de rigueur. If you make this, and I hope you do, be very careful not to overbake the layers, and when making the frosting, double (or even triple) the amount of butter called for. 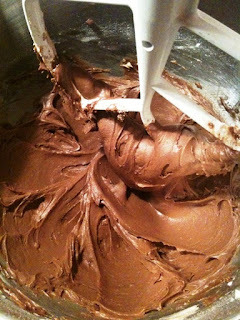 I knew the frosting needed something as I was mixing it, and luckily recalled the words of Chef Robert, my inspiring cooking school teacher, who told us on the first day of school, "The answer to every question you will ask is: more butter." This frosting can take a lot of butter -- so bring it on. Coming up next: Two more fabulous and unusual cakes! Stay tuned. 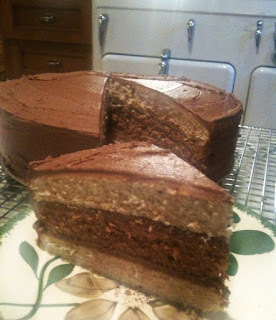 Wow - this one sounds right up my alley - love mocha and spice cake!